Blyth’s unbeaten run came to an abrupt end against a Seaham side who were much better than their league position suggests. Blyth took the lead with an early penalty but the home side hit back with a converted try. Seaham were using the steep slope of their pitch to good effect and scored another two tries but McCardel kept Blyth in the game with two more penalties. A series of bad injuries didn’t help Blyth’s cause and Seaham scored their fourth try to give them at least a losing bonus point. The visitors rallied and Lee Gallon crashed over for their first try. But two yellow cards effectively killed Blyth’s chances of getting back to the game and the home side scored again bringing the score to 34-14. 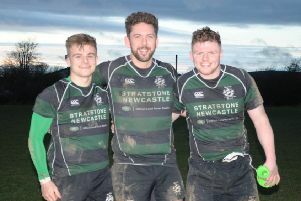 When up to full strength, Blyth finally managed to get their act together and two tries by Nick Fraser and Tom Bowman narrowed the score but it was too little too late. Blyth need to write this defeat off as a bad day at the office and regroup for next week’s visit of Newton Aycliffe, which kicks off at 2.15pm.